Astronomers Want To Know: Does This Interstellar Visitor Have A Message For Us? : The Two-Way 'Oumuamua is the first of its kind: an object from outside our solar system, observed by astronomers. Now, a group of researchers is trying to find out if it is transmitting any signs of life. 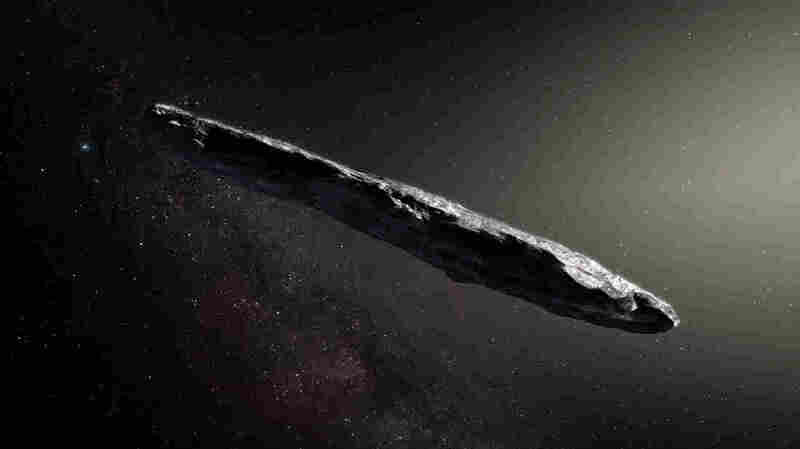 An artist's illustration of 'Oumuamua, a cigar-shaped interstellar object discovered in October. Now, astronomers want to know if this interloper might harbor life. It's time to find out what, if anything, our "mysterious interloper" has to say. That, at any rate, is the guiding idea for a team of astronomers, who announced Monday they plan to check out an interstellar object for signs of life. 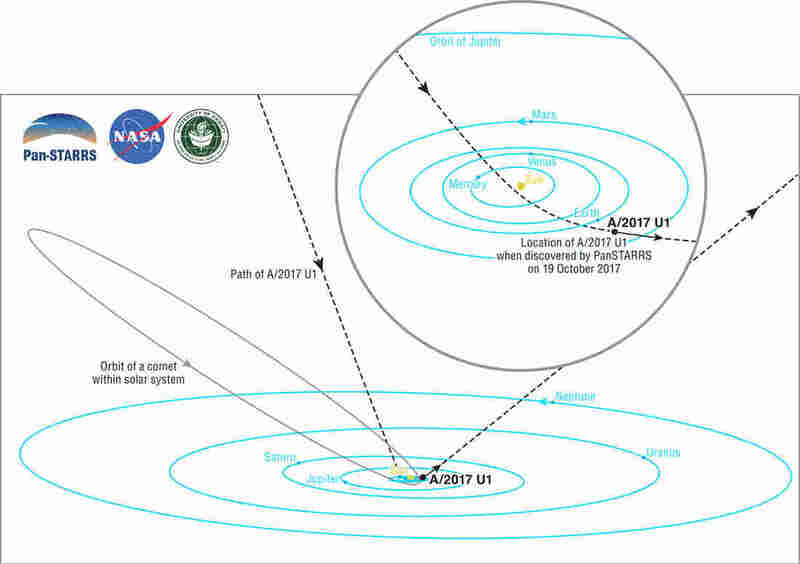 Beginning Wednesday, the group Breakthrough Listen will closely scan the asteroid 'Oumuamua, a recently spotted space rock that hails from outside our solar system. The skinny object is the first of its kind that scientists have observed. And since it has already whipped around our sun and embarked on its long return to parts unknown, researchers working with the international organization want to seize their limited opportunity to find out if it really is just a naturally occurring phenomenon — and not something more. "Researchers working on long-distance space transportation have previously suggested that a cigar or needle shape is the most likely architecture for an interstellar spacecraft, since this would minimize friction and damage from interstellar gas and dust," the group said in its announcement. "While a natural origin is more likely, there is currently no consensus on what that origin might have been, and Breakthrough Listen is well positioned to explore the possibility that 'Oumuamua could be an artifact." "The possibility that this object is, in fact, an artificial object — that it is a spaceship, essentially — is a remote possibility," Andrew Siemion, a member of the initiative and director of Berkeley's Search for Extraterrestrial Intelligence Research Center, told The Washington Post on Monday. "We don't want to be sensational in any way, and we are very realistic about the chances this is artificial," Yuri Milner, the Russian billionaire financing the project, told the Scientific American, "but because this is a unique situation we think mankind can afford 10 hours of observing time using the best equipment on the planet to check a low-probability hypothesis." And they'll be checking on that hypothesis by scanning the object for possible artificial transmitters through a radio telescope at West Virginia's Green Bank Observatory. Time will be of the essence, however. "We might have, for moderately large telescopes, another handful of days, maybe a couple of weeks," Karen Meech, an astronomer at the University of Hawaii Institute for Astronomy, which discovered the object, told NPR's Nell Greenfieldboyce in October. "So we don't have much time to study it." Meech acknowledged to the Post that 'Oumuamua's characteristics are "entirely consistent with being a natural object" — but, she added, "this is the sort of opportunity that one would hate to miss, even if the chances are extremely low for success." 'Oumuamua, whose name means "scout" or "messenger" in Hawaiian, might yet have a revelatory message for us — and if so, Breakthrough Listen hopes to be there to hear it.